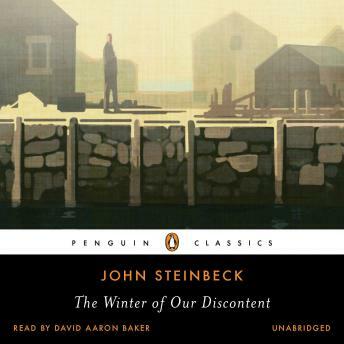 In awarding John Steinbeck the 1962 Nobel Prize in Literature, the Nobel committee stated that with The Winter of Our Discontent, he had “resumed his position as an independent expounder of the truth, with an unbiased instinct for what is genuinely American.” Ethan Allen Hawley, the protagonist of Steinbeck’s last novel, works as a clerk in a grocery store that his family once owned. With Ethan no longer a member of Long Island’s aristocratic class, his wife is restless, and his teenage children are hungry for the tantalizing material comforts he cannot provide. Then one day, in a moment of moral crisis, Ethan decides to take a holiday from his own scrupulous standards. Set in Steinbeck’s contemporary 1960 America, the novel explores the tenuous line between private and public honesty, and today ranks alongside his most acclaimed works of penetrating insight into the American condition. This Penguin Classics edition features an introduction and notes by leading Steinbeck scholar Susan Shillinglaw.